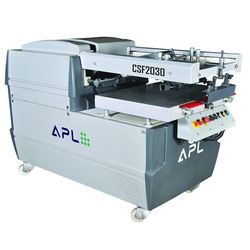 We are a leading Manufacturer of mechanical flat screen printing machines from Faridabad, India. Backed by a diligent team of professionals, we have been able to manufacture and supply an excellent range of Mechanical Flat Screen Printing Machines. This is economical and high speed use for graphic industries. Along with that, our screen printing machine is tested by our experienced quality controllers on specified quality parameters. This screen printing machine can be obtained at affordable rates. Looking for Mechanical Flat Screen Printing Machines ?